INTRODUCTION: It has been suggested that a proopiomelanocortin peptide beta-endorphin may play an important role in temperature regulation and therefore have specific heat stroke response patterns. 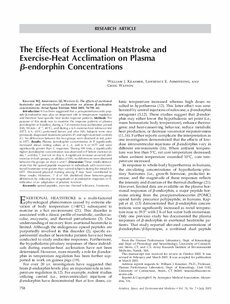 METHODS: The purpose of this study was to examine the response patterns of plasma beta-endorphin at baseline, during a 7-d exercise-heat acclimation period (HA; 90 min x d(-1), 40 degrees C), and during a 6-h exercise-heat tolerance test (HTT; 6 h, 40 degrees C) performed before and after HA. Subjects were nine previously diagnosed heatstroke patients (P) and eight matched controls (C). No differences between the two groups were observed at rest, prior to HTT. RESULTS: Plasma beta-endorphin concentration in P significantly increased above resting values at 2, 4, and 6 h of HTT and were significantly greater than C responses. During HA tests, a significantly higher beta-endorphin concentration was observed in P before exercise on day 1 and day 7, but not on day 4. A significant increase occurred after exercise in both groups, on all days of HA; no differences were observed between the groups on days 4 and 7. DISCUSSION: These results demonstrate that the opioid peptide responses in individuals with recent exertional heatstroke were greater than control subjects during the initial 6-h HTT. Decreased physical training among P may have contributed to these results. However, 7 d of HA abolished these between-group differences by reducing the magnitude of beta-endorphin responses in P, indicative of an adaptation of pituitary function.